Marucho. Could Ren be telling the truth or is it just another cover up? 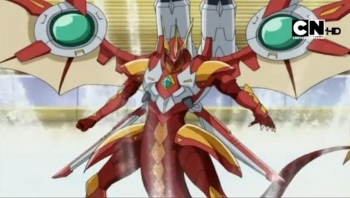 Bakuganbuzz Episode Rating(in G's): 820G's! And it's the end of the third season! This is the last of the Gundalian Invaders arc, and the finale to the war between the Gundalians and the Neathians (or should I say between Barodius and the rest of the Gundalians and Neathians combined). I'm sure it's no surprise to everyone that Dharak lost and Drago won. It wouldn't be the end if the protagonists lost. Well, at least their fight proved entertaining, despite the long history lecture of Code Eve in the beginning. And there are some surprises as well, like Drago having another evolution (again?!) and Linehalt going all bright and angelic and feathery. The third season has a good ending (although it really felt rushed because it's only 39 episodes long). Now we get to anticipate the fourth season. Just one problem: we don't have any previews! I keep on waiting for anything about the fourth season other than a summary, but there's nothing. Oh well, guess all we can do is wait. You can watch the previous episodes and seasons at Bakugan Tv Show, as well as look out for the new episodes in the future. It's the second to the last episode, guys! So, as all second to last episodes go, we have a cliffhanger at the end. I would love to go on and on about what happened during this latest episode. But I saw truth when one comment stated that I reveal too much when making a post about an episode. Sorry about that (I do get carried away, don't I?). Well, I'll keep this short so no worries! Lots of action and Dharak's awesome power sum up this episode. It's like nothing can stop Dharak. The Gundalians are also still continuing their backstabbing habits. 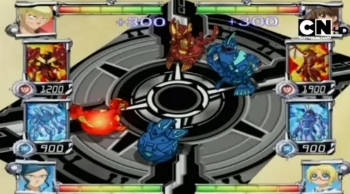 In the end, Dan and Drago and Barodius and Dharak are transported by the Sacred Orb to a place (or some kind of transcendent being) called Code Eve. And then.. it's a cliffhanger. I just wonder about one thing. If Kazarina still lives, she might really have become Barodius' queen. He was really upset when he heard of her death, even ordering Dharak to "kill them all.. for Kazarina." This episode had Kazarina's fate written all over it. She's the mistress of casting spells and brainwashing techniques, after all. Question: How do we break a spell when it is tied to the master's life? Answer: Destroy the master. In this episode, this is exactly what was done to Mistress Kazarina of the Twelve Orders. Normally, it is usually the hero or the protagonist who kills the enemy. In Kazarina's case, she was killed by her own teammate. But given how much betrayal and scheming goes around the Twelve Orders, is it any wonder she backstabbed by one of their own? What is so sad about her death is Lumagrowl now has lost his partner. Personally, I think Lumagrowl could find a better partner than Kazarina. He even turned against her just to battle Aranaut on his own. The part where Lumagrowl walks off slowly was really sad. On a brighter note, we get to see Lene, Zenet, and Jesse back in their normal selves! Barodius now only has Gill, Stoica, and Airzel on his side. Looking at the preview for the next episode, however, maybe the Gundalians still have the upper hand because of Dharak's enormous power. EDIT: Apologies again because off the delay of this post. The tv show really took a long vacation over the holidays that I almost forgot that the 36th episode was already out! So let's cut to the chase. We only get snips of the battle between the brawlers and the Gundalians, and basically Drago was the only one not really hurt. While the other brawlers had a hard time bringing down even just one of the Gundalians, it was like Drago didn't even break a sweat as he took down ALL of them. After taking them down, Dragonoid Colossus took them through the portal to Neathia, while Stoica and Airzel went after them. Throughout this entire time, Kazarina and Fabia are battling each other. Their battle is actually the highlight of the episode. Just as Aranaut was about to lose, help comes in the form of Mason, and --- lo and behold! --- Nurzak. Seriously, just how many times does this guy have to be presumed dead and then turn up alive and well in the future? Oh! Also look forward to the new partnership of Linus and Rubanoid! 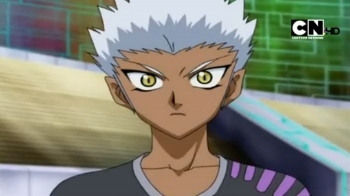 This shouldn't have been surprising, as they're both Pyrus brawlers and they both lost partners, and we couldn't expect Ren to handle two Bakugan. But I was surprised, nonetheless. Hurray for these two! It was great seeing Linus and Rubanoid brawling again.